(MoneyWatch) Apple (AAPL) has many tools in its competitive basket: great industrial design, a mastery of supply-chain issues, marketing savvy and a huge bank account. But perhaps the most important and subtle of the company's strengths is attitude. Success breeds success, and a winning attitude can be invaluable. But that confidence is beginning to slip. Take Apple's potshots yesterday at Google's (GOOG) Android operating system and Samsung the day before the newest Galaxy phone is announced in the U.S. That smacks of a company living in fear, and perhaps aware of the serious weaknesses that it must grapple with. An Android phone is often a free replacement and "the experience isn't as good as an iPhone"
Global market share figures that show Android with a 3.5 to 1l lead over the iPhone may not be "accurate"
This is notable because Apple almost never comments on other companies' products. In the past, Steve Jobs or one of his subordinates might make the occasional dismissive or snide comment, but not seemingly as part of a concerted effort to undermine a competitor. That began to change when Jobs once attacked Google, RIM, Nokia and small tablets during an earnings call. It was unusual for Jobs to be on earnings calls at all, let alone to use one as a platform to attack rivals. This was in 2010, by which time the threat from Android had become undeniable. Schiller's comments build on a growing willingness by Apple to address competitors, particularly Samsung, whose Galaxy phones have proven extremely popular. The actual content of the remarks are another example of what people would have called the "reality distortion field," had Jobs been alive to deliver them himself. For example, Apple can claim what it will about conversions, but extensive market research by virtually all the companies that follow these markets show that Android phones have far and away taken the majority of global market share, even if the iPhone enjoys an advantage in its U.S. backyard. Yes, there are phones that run older versions of Android, but in a way older iPhones that updated to the current iOS 6 software don't get all the features of the operating system, and so effectively create somewhat different versions. As for free, that's the upfront price to a consumer of a base model iPhone 4 these days. 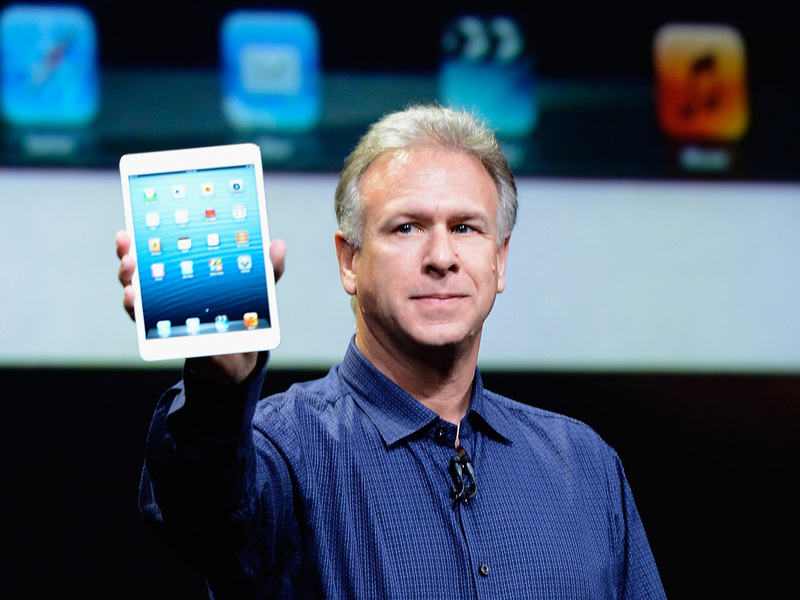 And clearly the old criticism of small tablets fell away when Apple introduced the iPad mini. Schiller's interview is an example of Apple sweating in public. Recent versions of the iPhone have not been especially innovative. Most of the world -- and this is a global industry -- focuses on Android. Apple's stock price is off by more than 39 percent from a 52-week high of $705.07. And there's no indication that Apple is currently at work on some revolutionary product that will create a new market with a high barrier to entry, as it has done in the past. These are reasons for any company, including Apple, to sweat. And a new version of an Android smartphone that has proven wildly popular is only turning up the heat.